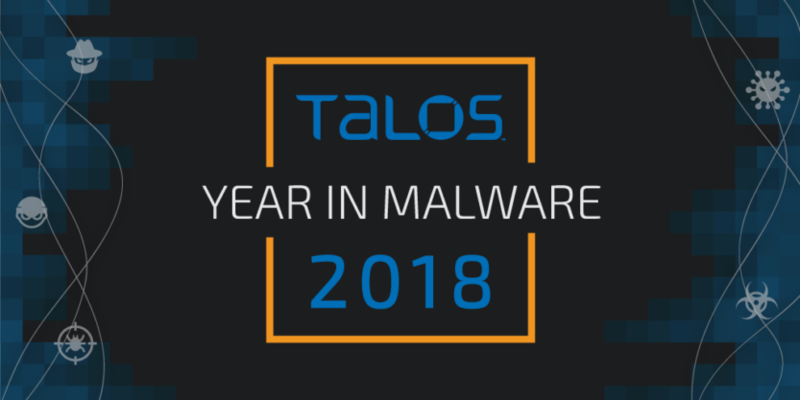 Talos did a really good job summarizing some of the top threats seen this year. The original post can be found HERE. The aforementioned Olympic Destroyer malware started the year out with a bang. This attack first emerged the night of the Opening Ceremony in South Korea, temporarily taking down the Olympics’ ticketing website and infecting systems at the stadium where the ceremonies were being held. Talos identified several malware samples that indicated a malicious actor hoped to disrupt the ceremonies, as the malware only contained destructive capabilities. In the following weeks, researchers attempted to identify who was behind the attack. However, the malware included several false flags that made attribution incredibly tricky. Olympic Destroyer would eventually return with a variant later in the year that makes it tougher to detect. in May. At the time, we released all of our findings on the malware in an attempt to inform consumers that they should reset their wireless routers as soon as possible. We estimated that VPNFilter, which could completely take over routers and restrict internet access to users, had infected 500,000 devices worldwide. While the attackers never triggered VPNFilter, it had the potential to be very serious. If undetected, the malware could steal users’ website credentials and monitor Modbus SCADA protocols, and could even completely brick the device. The only way to remove VPNFilter from your device is to completely restart the device (we even made the national news with this advice). Even after our initial report, Talos researchers continued to look into the malware. Our understanding of VPNFilter grew, and in June we published our updated findings. Talos discovered that the malware infected several other vendors’ devices, as well as a new stage 3 module that gave all samples of the malware the ability to completely shut down an infected device. It didn’t stop there, either. The attackers eventually added on seven new third-stage modules to VPNFilter that gave the malware even more destructive capabilities. These new features allowed attackers to filter data, disguise communications with command and control (C2) servers and included encrypted tunneling capabilities. More consumers are turning to mobile devices for their every day needs rather than desktops. And as more every-day consumers use their smartphones for shopping, email and more, attackers can take advantage of those people who may not be as aware of online threats as they should be. This has opened the door to mobile malware that relies on tricking users into enabling malicious apps to access content they shouldn’t be able to otherwise. In some cases, attackers have gained the ability to completely take over a mobile device, as in a small campaign we discovered in India in July. In a small campaign, Talos discovered 13 devices infected with mobile device management (MDM) software that could allow attackers to tack on malicious features to legitimate apps, giving them the ability to exfiltrate information such as contacts, photos, messages and location. Later on in the year, we discovered this campaign targeted more devices than we initially thought and even connected the attack to another actor who had a history of targeting Android devices. Another trick attackers liked to use this year on mobile devices in disguise. In the case of GPlayed, an attack we discovered in October, one actor was able to trick users into downloading a malicious app that disguised itself as a legitimate Google Play app store. Once installed, the malicious app can load plugins and inject scripts. Eventually, GPlayed evolved to the point that it included a banking trojan that attempted to steal users’ login credentials to financial services websites.